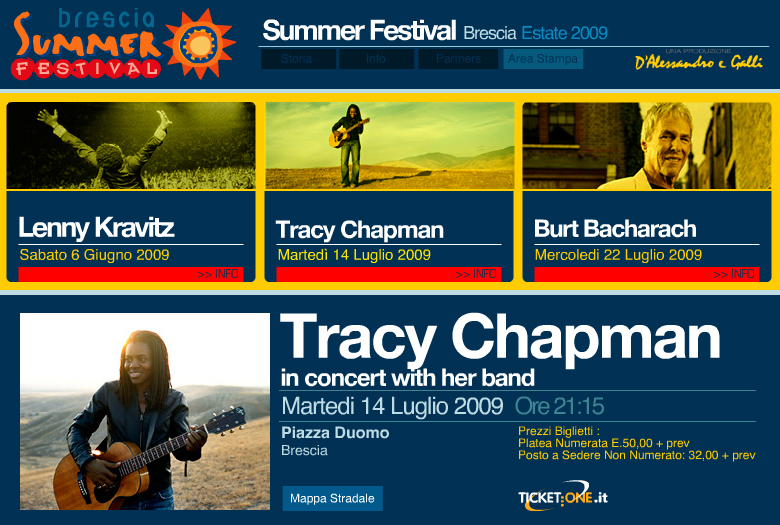 Brescia, 14th July 2009 – Piazza della Loggia packed with a warm gratified audience was the perfect setting for the show by Tracy Chapman, the famous US singer/songwriter with a poetic intimate character. The reproduction of her intense voice, along with her acoustic guitar, the bongos and that combination of warm sounds for which Tracy has been admired for over twenty years, was achieved thanks also to Outline Butterfly: a loudspeaker system that in itself is light-weight and compact (34 kg and 70x60x24cm), but in the case of Piazza della Loggia was made up of just 14+14 Hi-Pack units per side (each equipped with four 8” woofers and a 3” compression driver). The bottom end was reproduced by 7+7 Outline Victor Live subs (2×18” – 110x55x60cm and 78 kg) and LAB 21 infra-subs (just two units positioned in the centre): all the cabinets were laid out in a cardioid configuration, to keep the stage clear of excessive low frequencies. Four Outline Micra II enclosures, installed in the edge of the stage, were used as front-fill systems, for the benefit of the front rows of the audience. Also to ensure the audio chain the utmost efficiency, the amplification of the signals – fed from a Digidesign console – was entrusted to Outline T7 units: these power amplifiers are also ultra-light (12 kg) and compact (each requires just one standard 19” rack unit of space – a feature no other unit on the world market is able to offer). Cipiesse Produzioni per lo Spettacolo (http://www.cipiesse-bs.it/) – the owner of the Outlinearray system – was the Brescia rental firm handling the entire operation. Giancarlo Paladini, free-lance system engineer working on behalf of Cipiesse, commented: “What the arrays fed out was so exact that the concert seemed to ‘breathe’ – I mean it was utmost simplicity, harmony and pure listening pleasure. After the first fifteen minutes, such a great entente had been created between Chapman and the audience that it was necessary to remind oneself that there was amplification involved (the rig was also almost invisible to the eye…). There was a limpid clarity on the mid-high frequencies and warmth on the low ones, which were powerful and solid, full-bodied but also will controlled. Wonderful show Tracy, thank you so much for all the emotion and pathos that your music brings to our hearts. It’s a promise that you keep every night on stage. Thank you for the setlist Ettore!